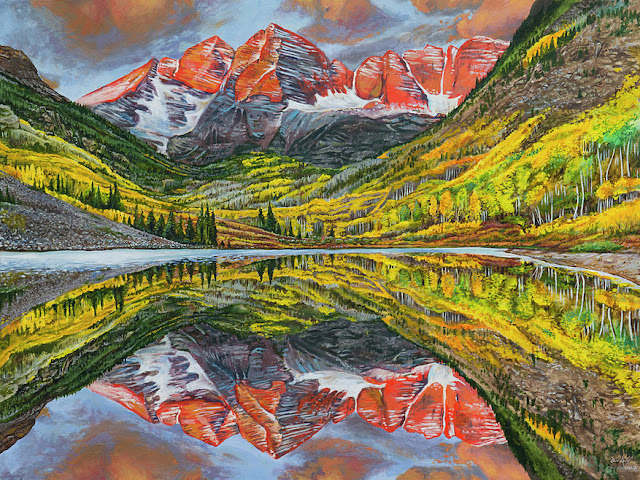 Just finished my latest artwork in progress featuring the Maroon Bells and Maroon Lake from Aspen, Colorado. I looked through hundreds of images of these peaks from different times of day, from different vantage points and in different seasons. This was a compilation of what I believe is the most idealistic/iconic view of this scene. The sun is rising and hitting the peaks and clouds above turning them bright orange. The aspen groves have turned yellow and orange in the fall. The lake is still and calm creating a perfect reflection of the 14,000 ft. peaks. All together this painting took almost 30 hours. It measures 4 feet wide by 3 feet tall.